For a very low price of last night’s leftovers, Miss Kitty will endorse your novel efforts too. Not everyone has photographic evidence of that cardinal moment of their writing career: the moment they started writing their first novel. 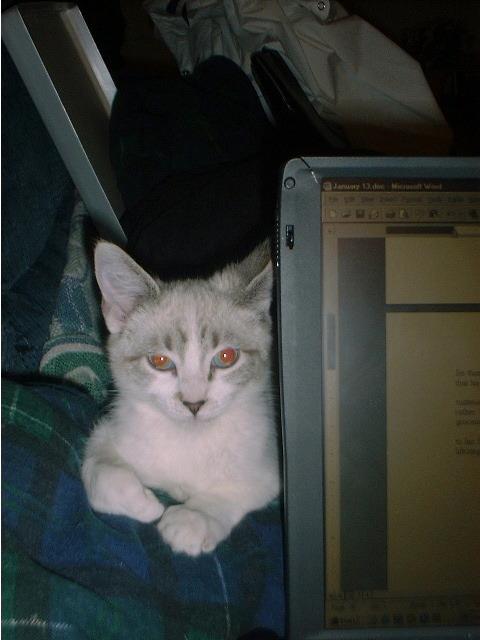 When I took this picture, I was only trying to capture the behavior of my new cute kitten, Miss Kitty, who would jump into my lap anytime I cracked open the old laptop. It never occurred to me that I was also capturing a moment that would define my entire writing career, and in many ways, my life. If you look closely, you can see the name of the Word document: January13.doc. Although not reflected in the title, the year was 2001. I often named my writing files after the date started, until I had a working title. I had been watching TV when a sentence popped into my head and would not go away. I realized this was my muse trying to get my attention, and so I opened the laptop and started writing with only that single sentence as a starting point. And thus, St. Charles at Dusk was born. I’ve written about how the story was a real labor of love for me…multiple rewrites, years where it did not get touched at all, edits upon edits…but I finally finished and self-published it in 2011. Miss Kitty, the unexpected wingman, is turning 12 this year. What a great memory to have documented. Enjoyed this! Thank you! I had been searching my files awhile trying to find this picture, and I’m glad I still have it. Still remember it like it was yesterday. Very cool of you to rediscover this so many years later! Indeed! With me it’s a dog in my lap and a cat on my shoulder! This is such a fun post:) much luck with your endeavors! I’m normally not a fan of pictures, but those few moments like this remind me that they can be quite valuable 🙂 Glad you captured the moment so well! Thanks for the comment 🙂 Its funny, at the time I just took the picture because I thought she looked cute…and only later did I realize what I was actually taking a picture of. I just wish it was a better quality!